Sending a follow-up message to thank the interviewer can make the difference between getting hired and being rejected. Of course it won’t save you if your interview went badly from start to finish, but it can definitely sway their decision if it’s neck-and-neck between you and another candidate! So, I’m going to walk you through a couple of great thank you email samples to follow up after your interview and make the company want to hire you. These samples can be used for email, or for sending a thank you letter in the mail. There are also two optional steps you may want to include. These next two pieces aren’t 100% necessary for a thank you note or thank you email after the interview, but are a nice touch you can add. You’ll see these pieces in the thank you note/email examples below. You can use any of these templates after your interview. And below each sample email, I’ll explain the strengths and weaknesses of each template. Here are three good interview thank you email samples you can use after the interview. These can also be sent in the mail as a note if you want. Later in this article, I’ll cover the pros and cons of sending thank you emails versus sending a thank you letter/note in the mail. So if you’re not sure which to send, keep reading! I wanted to take a second to thank you for your time <yesterday/Friday/etc>. I enjoyed our conversation about <specific topic you discussed> and enjoyed learning about the <Job Title> position overall. It sounds like an exciting opportunity, and an opportunity I could succeed and excel in! I’m looking forward to hearing any updates you can share, and don’t hesitate to contact me if you have any questions or concerns in the meantime. Thanks again for the great conversation <yesterday/Friday/etc>. This is obviously a very short, casual message. I come from a background in tech recruiting, where companies are NOT very formal. They use email (or even google chat), and they keep it brief. While the sample thank you note above could be sent in the mail as a letter, it’s best as an email after your interview. And it’s best when interviewing at start-ups, technology companies, or other modern companies. Those companies will NOT want to see a formal, five-paragraph thank you letter that takes up a full page. In fact, it might make them want to hire you less. However, if you’re in a more traditional or formal industry (like wedding planning), or if you want to send a thank you note in the mail rather than email, one of the next two thank you note examples might be better. Thank you for taking the time to speak with me <yesterday/Friday/etc.> about the <Job Title> position at <Company Name>. It was a pleasure talking with you, and I really enjoyed hearing all the details you shared about the opportunity. The information you shared about <Something specific about the job that interests you> sounded particularly interesting. I am confident that my skills will allow me to come in and succeed in this role, and it’s a position I’d be excited to take on. I’m looking forward to hearing from you about the next steps, and please don’t hesitate to contact me in the meantime if you have any questions. This follow up example is a little longer and more formal. You could send this as a thank you letter after the interview, or as an email. Note that at the end of the third paragraph, you could also add details about WHY you feel confident you’d succeed in this role. That will make this thank you email template more convincing. So, try to remind them of something you shared in the interview, like a piece of past experience, or a skill you have, that will prove to them you’ll be able to come in and be successful in their role. Thank you for taking the time to meet with me <yesterday/Friday/etc>. I’m very excited about the opportunity to work at <Company Name>! The <Job Title> role certainly sounds exciting, and it’s a role I believe I’d excel in thanks to my <experience or skill that would help you succeed in their job>. I look forward to hearing feedback as soon as you have any updates and would love to continue discussing the opportunity with you. Feel free to contact me if you have any questions or need clarification on anything we talked about in the meantime. Thank you again, <Interviewer’s Name>. This is the most formal of the three thank you notes we’ve looked at. Of course, you can adjust the tone/greeting in any of these thank you note samples. You could also take pieces from each example and combine them, or add more customization. So if you like one, but feel it’s not formal enough, you can make adjustments. However, in most modern industries, you should be careful not to sound too stiff/formal. Your note should sound genuine. What would you say if you were standing there, thanking them in-person? Writing out a thank you note isn’t much different! Most people write very differently than they talk, and quite often that’s a mistake. So, Which Thank You Note Sample Should You Use? Choose whichever you feel matches your situation (and industry), and whichever one you feel will allow you to customize it. Remember, one of the keys to sending a great thank you email after your interview is customizing it, so pick the template you feel is best for this. The samples above are designed so anyone can take them and use them. No matter what you discussed in your interview. However, you should try to customize more based on details you talked about. You really want to make them feel like you remember the conversation and appreciate their time! For example, maybe the interviewer told you they’re going to watch their son at a big basketball tournament that evening. Should You Send an Email or a Note/Letter? However, in specific cases, you may want to send a thank you letter in the mail after an interview. Well, a paper thank you note/letter might be better if you’re in a very traditional industry (like wedding planning). Or if you’re interviewing for a very high-level position (like CFO, Head of Operations, etc.). But for most job seekers, I recommend sending a thank you email. If you’re sending an email, I recommend sending it the first business day after your interview, around lunchtime. So if you interviewed Mon-Thur, send it the next day. If you interviewed on a Friday, send it Monday at lunchtime. And if you decide to send your thank you note in the mail, I still recommend you send it one business day after the interview. Of course, the time of day doesn’t matter in this case. Email templates are only as good as the effort you put into filling them out and proofreading them. Go over every detail and make sure it actually makes sense for your situation. If not, sending that thank you email or letter will do more harm than good. Otherwise, it’s going to sound a bit odd, and they might suspect you just cut & pasted from a template. Not good! So be careful, take your time with these sample emails, and make sure every single word makes sense. 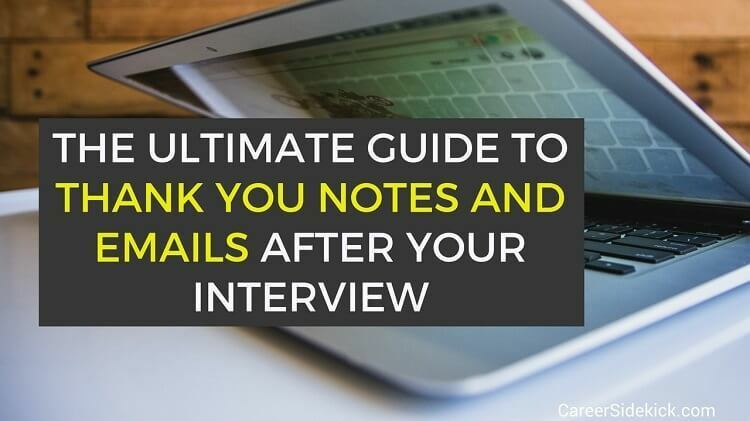 If you follow the advice above, you’ll have a great thank you email or letter to send after the interview so you can land the job!